Protein powder is one of the best ways to get your protein in, especially if you’re not able to get a sufficient amount of protein through your meals on a daily basis. Plus, with so many delicious protein powder options out there, you can add it to almost anything, from breakfast to dessert! From protein smoothie recipes to delicious dessert recipes with a touch of protein, these protein powder recipes will help you stay satisfied and lose weight fast! Protein powders are nutritional supplements that are helpful for those of us who aren’t getting enough protein from whole foods or want a convenient way to take protein on-the-go. There are many different types of protein powders that can be used for everything from smoothies to baking to cooking. As the name reveals, protein powders consist of powdered protein from sources like soy, pea, whey or casein. They come with or without carbohydrates, vitamins, minerals and other ingredients like fat metabolizers. Since protein is an essential macronutrient that helps build muscle, repair tissue, and make enzymes and hormones, protein powders can help you lose weight and tone your muscles! The general rule for baking is that you can exchange one third of flour in a recipe with protein powder. Don’t go overboard with the protein powder and remember, it’s not an exact substitute for flour when you’re baking. When you cook and bake with protein powder, your food can end up really dry if you don’t use a moisturizer. A moisturizer is an ingredient that moistens your food and weighs it down. Think: Greek yogurt, cottage cheese, apple sauce, bananas and cooked beets. There are tons of protein cookie recipes out there! Make sure that when you make them you use a fat like coconut oil, nut butter or actual butter to ensure you end up with a moist and crunchy cookie! Since pea protein powder has an earthy flavour, you can add strong flavours like peanut butter or chocolate to cover it up. This will ensure you get your protein in and whatever you’re making will still taste delicious. When you’re baking or cooking with protein powder, try to use stoneware/ceramic. This will offer a moister result and ensure your treats are as delicious as can be. Rachel Ray has an affordable 3-piece casserole set we love! If you don’t have stoneware/ceramic to bake in, lower the oven temperature 25 degrees and bake for longer when baking with whey protein powder. This will give you a moister final result and prevent your baking masterpiece from becoming dry and rubbery. This protein powder was made for all your baking needs! It’s sugar free, gluten free and bloat free, so you can get the taste of rich brownies without the guilt! With 20 grams of protein, you’ll feel full and lose weight quick! From protein shake recipes to cookies, this protein powder is awesome for baking! It’s rich in essential amino acids to support healthy weight loss, and is an energy-boosting protein source so you’ll feel great all day! This organic protein powder also contains a good source of fibre, iron and calcium, helping your body becoming stronger and healthier. It has a mild, nutty taste, making it perfect for baking your favourite treats! One scoop of this unflavoured powder will bake perfectly into your favourite treat to make it as high-protein as possible. With only 100 calories per serving and zero carbs, it will also help you reach your weight loss goals! 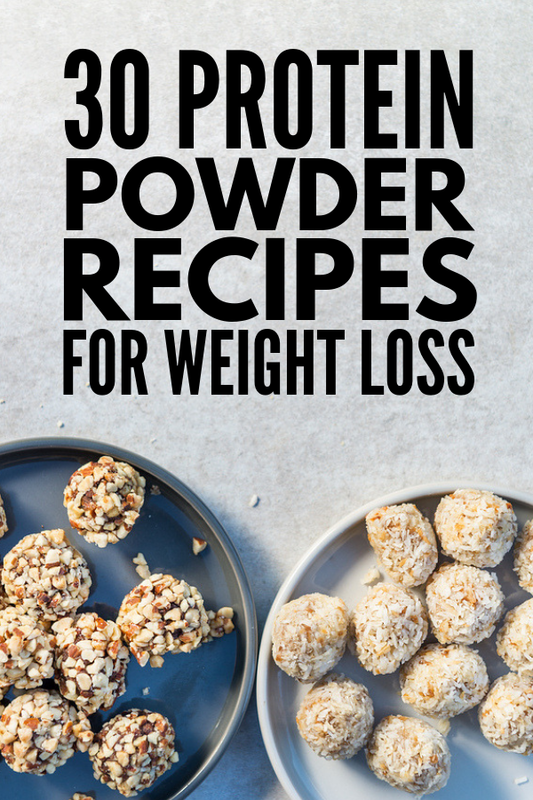 Cooking and baking with protein powder is one of the best ways to get in the daily recommended amount of protein and reach your weight loss goals in the process! Try out these recipes and see the results for yourself! If you loved this post on the best protein powder recipes, please share it on Pinterest! And if you want more awesome recipes like this, make sure to follow our Food Board on Pinterest!